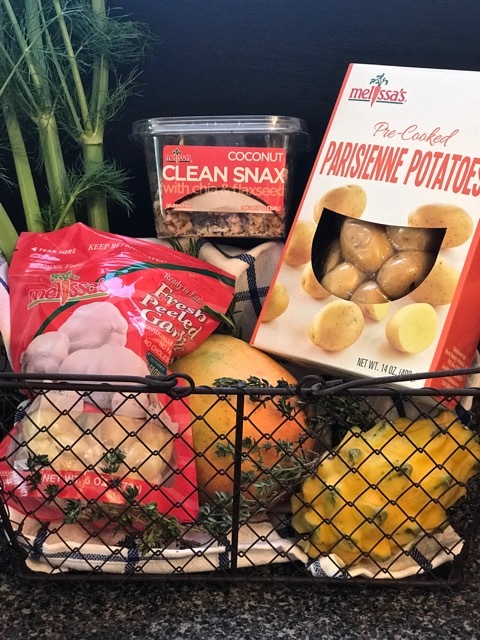 Tom came home from Melissa’s Produce event the other day toting, among other things, fennel, Melissa’s Parisian Potatoes, Melissa’s Coconut Clean Snax with Chia & Flaxseed, an Australian Mango, Yellow Dragon Fruit, and agave syrup. It was all stacked on the counter when I got home from work like some sort of “Chopped” basket (we’re semi-addicted to that show). “What are you going to make?” were the first words out of his mouth. I was in a good mood because a new(ish) soup cookbook from Betty Rosbottom had also arrived on this day. My favorite soup cookbook is Sunday Soup by Betty Rosbottom. We use it all the time. 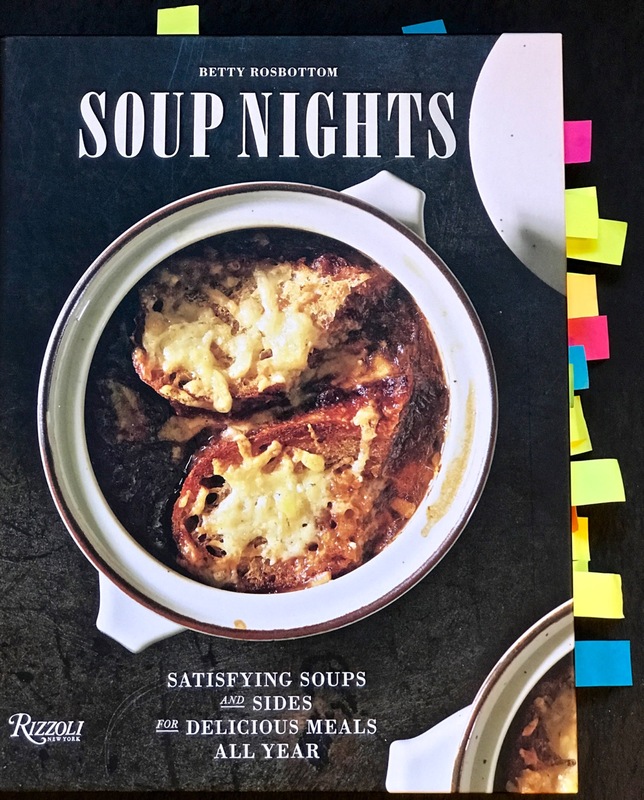 Somehow, I had missed that she published another soup cookbook back in 2016 called Soup Nights. I quickly sat down and started tabbing the recipes I was interested in trying. Tabbing is my favorite thing to do with magazines and cookbooks. 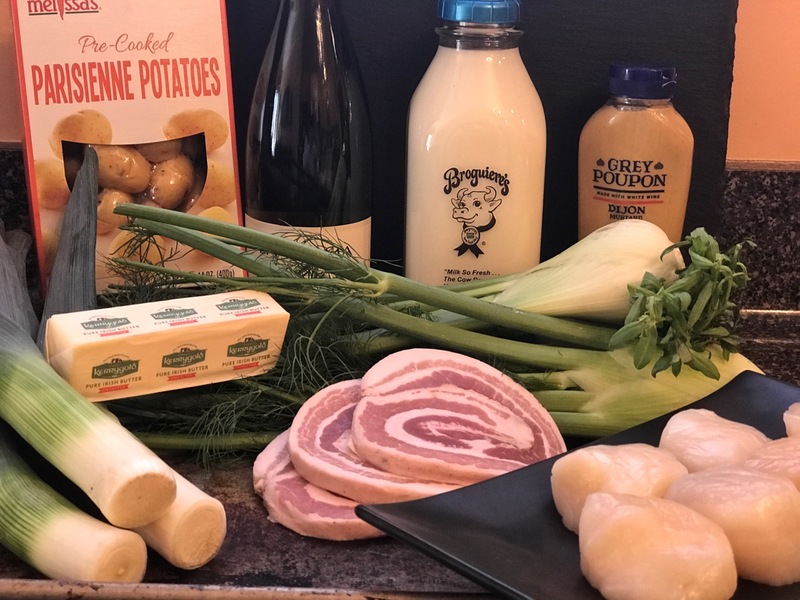 One of the recipes, Scallop and Fennel Chowder, called for fennel and potatoes. Bingo! As for the mango and dragon fruit, I decided to add arugula and a citrus vinaigrette to make a Mango, Dragon Fruit and Arugula Salad with Citrus Vinaigrette. Now, can I get my main course finished in a half hour? No way…sorry Ted Allen. I love scallops and am always looking for new recipes. I was able to speed this recipe along using Melissa’s Parisian Potatoes as they are pre-cooked. These creamy, gold potatoes added substance to the soup, so I was able to use non-fat rather than whole milk. I substituted pancetta in place of the bacon and puréed the ingredients, so it was soup and not a chowder. Leave it chunky if you want chowder. 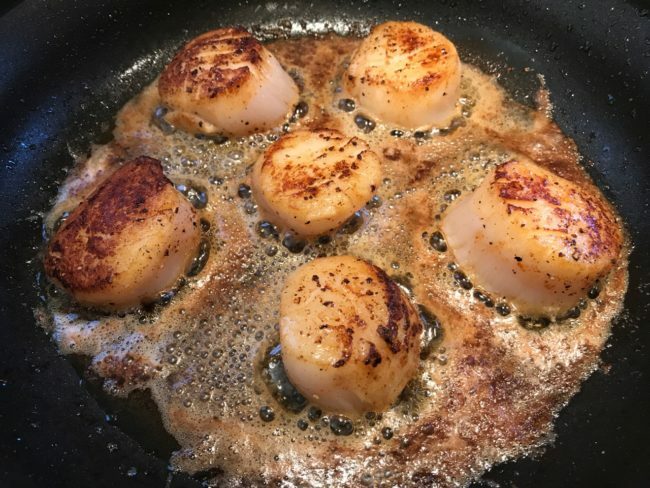 When deciding how many scallops to buy, I would recommend one large scallop per serving or two smaller ones. 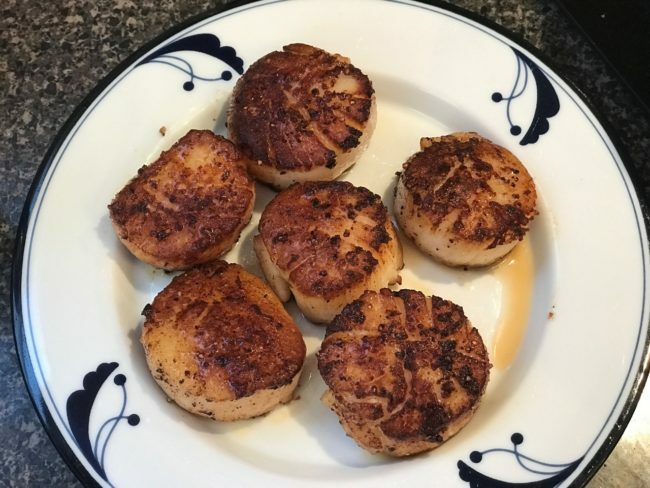 I used two big scallops per serving and not only was that expensive, but it was also really filling. 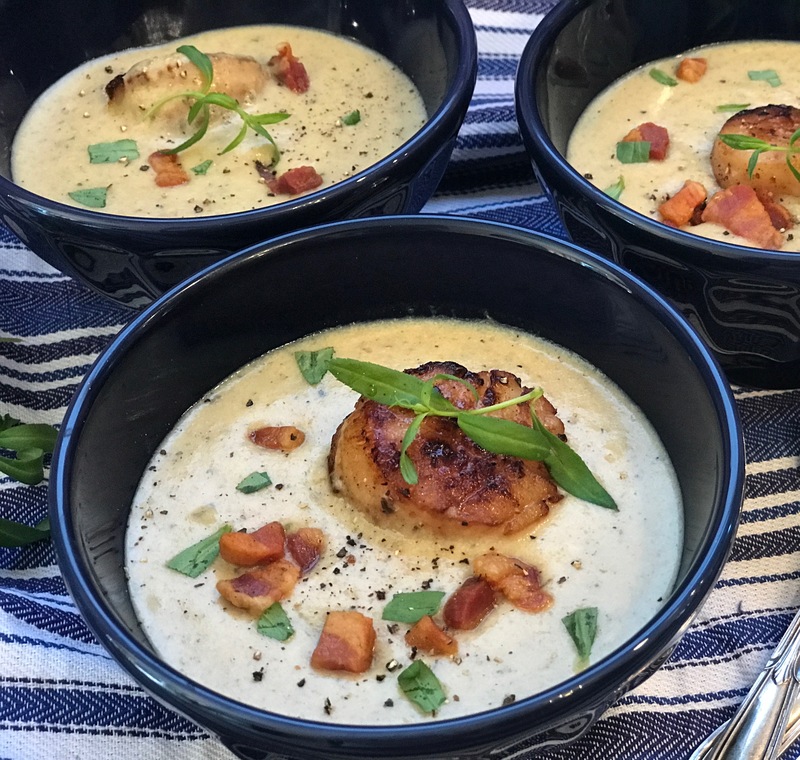 Place the scallops in the bottom of the bowls, top with the soup and sprinkle with the pancetta and more tarragon. 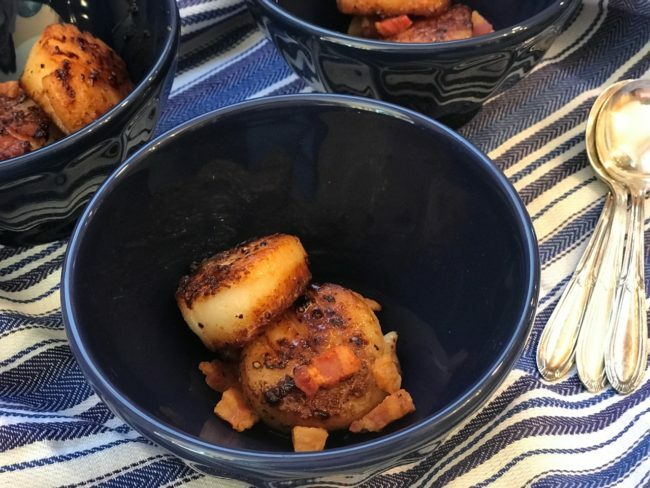 If you are having a party, make it the day before except for the scallops, and then reheat and cook the scallops just before serving. Heat the olive oil in a large, deep skillet (or Dutch oven) over medium-high heat. Add diced pancetta and cook until crispy. Remove with a slotted spoon to a paper towel to drain. Add the potatoes to the skillet and brown until crispy. Remove to a plate to cool. Remove half of the pancetta drippings and reserve for the scallops. 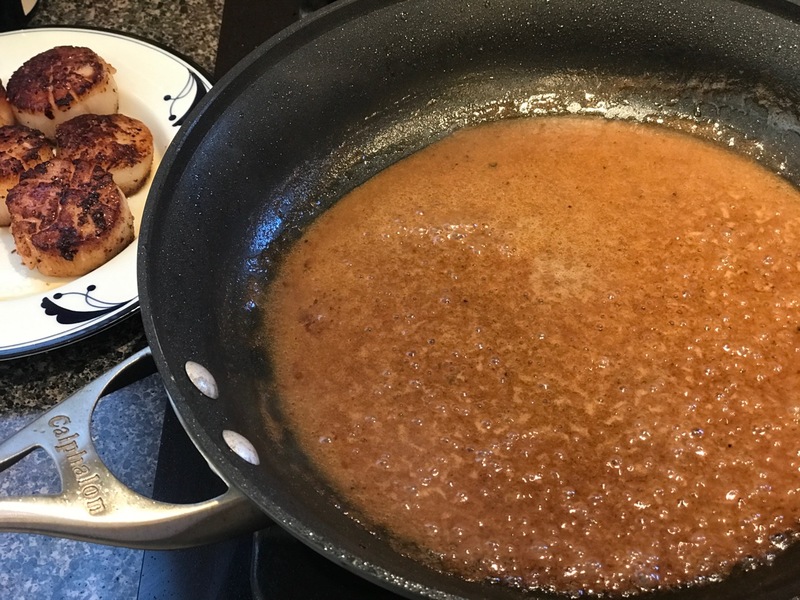 Melt 4 tablespoons butter in the remaining drippings. When hot, add the fennel, leeks and the herbs de Provence and sauté until just starting to soften. 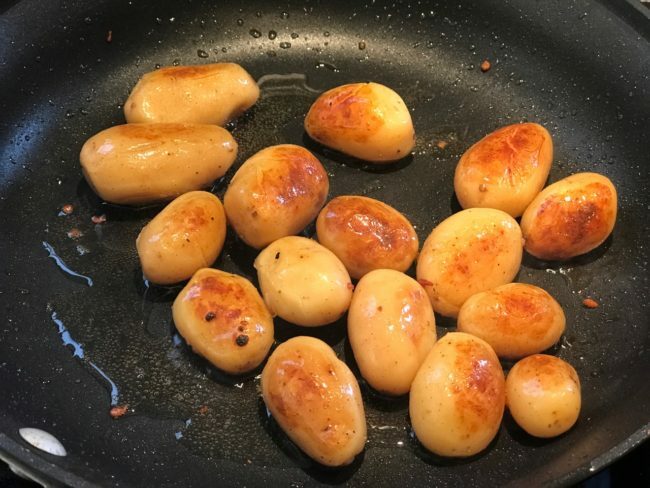 Add the potatoes back into the pot. Stir in the milk, tarragon, 1 teaspoon salt, a couple of grinds of black pepper and a pinch of cayenne pepper. Bring to a simmer, reduce heat to medium-low and simmer until vegetables are softened, about 15 minutes. 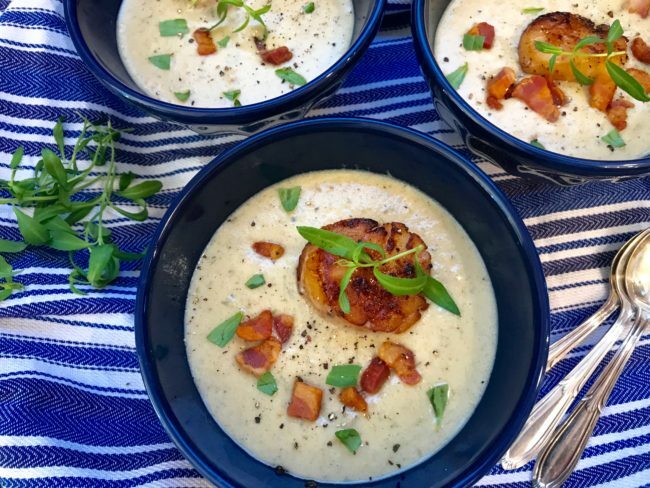 Puree with an immersion blender and simmer on low while you make the scallops. Pat the scallops dry with a paper towel and season both sides with salt, pepper and a pinch of cayenne pepper. In a large, heavy skillet over medium-high heat, re-heat the pancetta drippings and remaining 1 tablespoon of butter. When very hot, add the scallops in a single layer and cook until golden (1 to 2 minutes per side unless very thick then it may take longer). 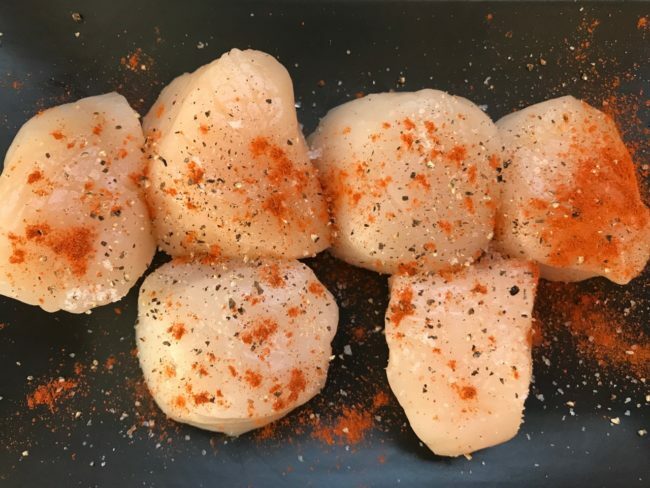 Remove scallops to a plate. To the skillet, add the wine and mustard and whisk constantly until reduced to about 4 tablespoons (5-6 minutes). 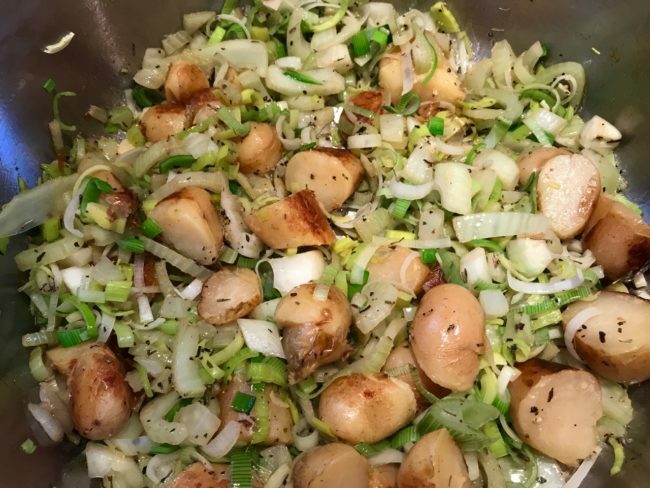 Remove the skillet from heat and add the broth to the soup together with any pan juices from the scallops. Season to taste with salt and pepper. 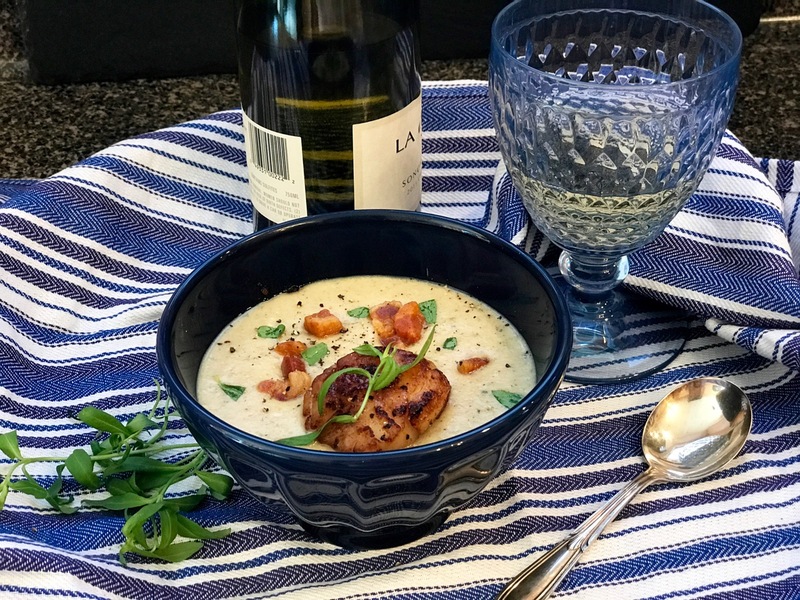 Place one large (or two small) scallops into the bottom of soup bowls. Ladle soup over and garnish with the diced pancetta and remaining tarragon. Bon appetite! Recipe adapted from Soup Nights by Betty Rosbottom.